Participants enter the seminar room somewhat reserved but full of expectations and are curious to know just what they are going to experience over the next 3½ hour preparation course. Anyone who has already attended a course or seminar by raw food head cook Nelly Reinle-Carayon a few times will know that they feel pleasantly and contentedly satiated afterwards and that they also take lots of new information and ideas home with them as well. 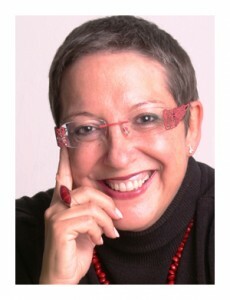 French by birth, Nelly Reinle-Carayon immediately captivates everyone with her charming and friendly nature. A successful author of recipe books, she lives in the Rhineland-Palatinate region and, among other things, offers raw food preparation courses each month which are based on the season current at the time. Whether it be “Be my Valentine”, “Spring Awakening”, “Summer in the City”, “Warm through the Winter” or “Raw Food for Advent” – there is something for everyone. Spring Awakening When she set up her company called RohKöstlich e.K. in 2007 and joined the raw food scene in Germany, she never dreamt that she would have such a positive influence on this fast growing raw food sector just three years later. Her first book entitled “Rohköstlich” even managed to claim first place in the category of “Best Cookbook Design” in Germany and second place worldwide in the “Gourmand World Cookbook Award” international competition. The international awards from the Eduard Cointreau foundation are not just for cookbooks but for wine and nutrition guides as well as recipe books. Her second raw food cookbook “Rohköstlich … aus Frankreich” is a tribute to her home country and is an enhancement for the raw food kitchen of both beginners and practicing raw foodists. It was in 2004 that she discovered and chose the raw food way, little knowing where it was going to take her. She had not the slightest idea what effect that decision was to have for her. At the time she simply would not have been able to conceive of the dramatic positive changes that this decision about her diet would have on her body, mind and soul! All she wanted to achieve initially with the help of raw food was to lose weight. But she was so impressed by the results that she took up this style of nutrition and everything that goes with it and increasingly turned it into her motto for life. She had considered the raw food diet to be a solution for minor ailments or even illnesses, nor for stimulating her spiritual vitality. All she wanted were real results in losing weight, visibly shed pounds – she had read that much about it – and it worked for her too. More than six years have elapsed since then and raw food head cook Nelly Reinle-Carayon has leant much about raw food and live food and also about herself. Above all during here intensive training with the renowned American raw food teacher Alissa Cohen. In 2008 she and her husband started the “Rohvolution®” raw food trade fair. This has helped spread awareness of the raw food world to a much wider audience. Since 2008 she has also been organising once-monthly raw food pot lucks at her home, where increasing numbers of people looking for tips on all aspects of raw food and solidarity meet up. These meet-ups are growing in popularity all the time. But her passion is and continues to be the preparation courses because she stimulates the creativity of the guests there and also gives them the encouragement to come out of their shadows. She also offers 1:1 coaching, of course, where she discusses the switch to raw food with her clients and organises the adaptation of the kitchen. In addition the passionate raw food cook offers catering for private and commercial events, is available to be your private raw food cook and can also prepare individual raw food menus for you. In 2011, in partnership with kitchen artist Stefan Walch, she started organising raw food theme nights in Speyer, with the aim of demonstrating her culinary delights to make live food cuisine and raw food cuisine appetising for a wider audience . You will find ideas and events concerned with all aspects of raw food in her regular blog at www.rohkoestlich.com/blog/ or on her website at http://www.rohkoestlich.com/.